The New Jersey Bill of Sale Forms are legal documents that will provide proof that a legal transaction has been executed. The forms will provide specific information with regard to the sales and purchases being transacted, seller and buyer information, change of ownership and more. Some documents will require notarization. Boat Bill of Sale – Required if a new owner would like to register their watercraft and prove a sale. Firearm Bill of Sale – For the record-keeping of both parties so that a receipt for the transfer can be provided. 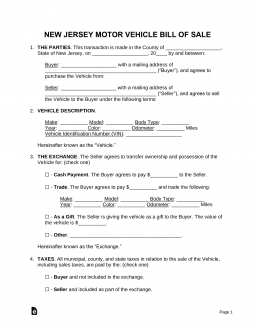 General Bill of Sale– A standard form that may be used to transfer any type of personal property. Vehicle Bill of Sale – Required by the Vehicle Commission Office to register a new or used car/motorcycle.